Itasca | White Wine | Northeastern Vine Supply, Inc. The newest grape from the U of MN breeding program. 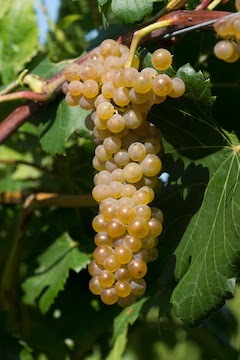 Itasca has proven itself to be among the hardiest cultivated grapes known, even surpassing Frontenac and Marquette in cold hardiness. Very vigorous growth, slightly more than Frontenac. Training to high wire cordon will help to de-vigorate these vines, but VSP can be used on lower vigor sites. Very productive. Ripens early to brix levels in the mid 20's and moderate acidity of around 10 g/L. With aromas of apple, pear, and violet and lower acidity, this selection is very well suited to making dry white wines and sparkling wines. Some very nice off dry wines have also been produced. Selected by U of MN. A $1.00 ROYALTY TO THE U. OF MN WILL BE ADDED TO EACH VINE. BR #2 VINES ONLY AVAILABLE AT THIS TIME.